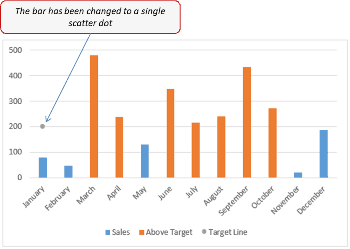 If you are in the sales department and your life is all about targets, this charting technique is for you. And if you are not, read it anyway to learn some cool excel charting tricks. The target line is controlled by the scroll bar, and as if the target is met (or exceeded) in any of the months, it gets highlighted in green. 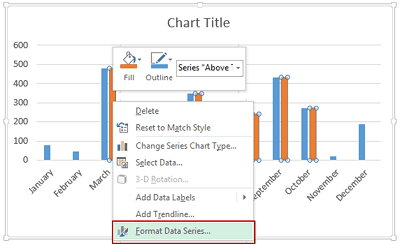 Create a scroll bar and align it with the chart. Fit the scroll bar along the chart. 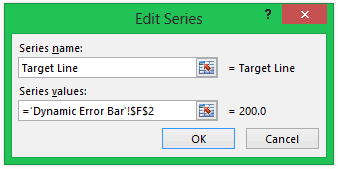 Click here to learn how to create a scroll bar in Excel. That’s it!! Now when you move the scroll bar and change the target values, the bars that meet the target will automatically get highlighted in a different color. 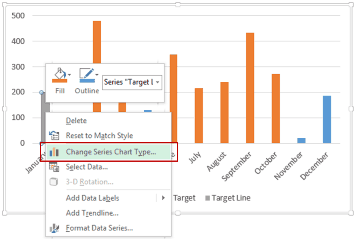 Dynamic Charting – Highlight Data points with a click of a button. Creating a Gantt Chart in Excel. Creating a Milestone chart in Excel. 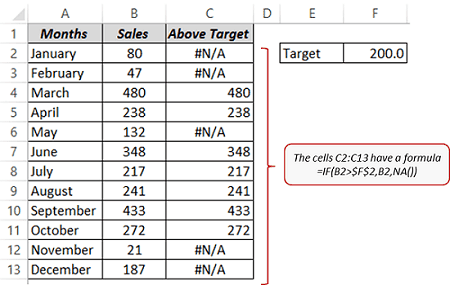 Creating Actual Vs Target Charts in Excel. Creating Combination Charts in Excel. 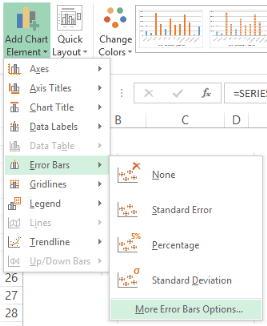 How to Create a Dynamic Chart Range in Excel. I love this tutorial but the I cannot overlap the data if I have more than one type of sum and one target. It works like the example with one, but if you apply this to one than one column, it tires to cover it as a series. Is this possible to go around? Hello! Thank you for your post, it worked well. If you are still accepting queries, I am an educator looking to create a dynamic target line across multiple assessments on the same chart. 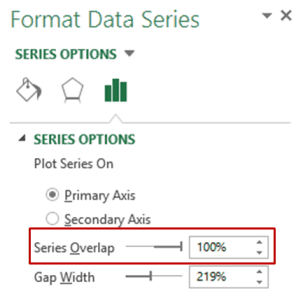 Using your method above, I can create one chart for each test a student has taken, but when I attempt for multiple tests for each student, the step that tells me to move the Series Overlap to 100%, it causes all but one bar to show per student. 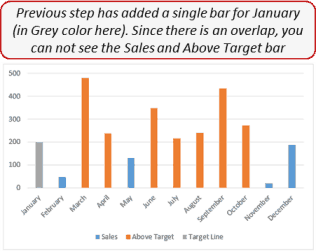 I would like to combine all tests for all students in a class into one chart, having each multiple test bar per student react to the dynamic target line as you show for the sales bar per month. 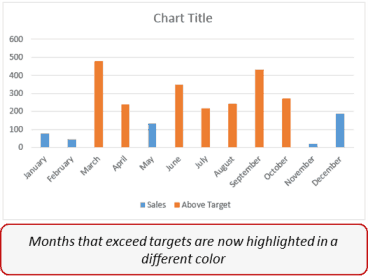 (Basically, for each month in your example and all on one chart, I would like to track the sales of 7 different products, and have each product sales bar show up next to each other, and all change color depending on the target line’s value). Is that something that can be done? I have the same problem. I love this tutorial but the I cannot overlap the data if I have more than one type of sum and one target. It works like the example with one, but if you apply this to one than one column, it tires to cover it as a series. Is this possible to go around? Did you ever get an answer? Great trick. This was very useful today. I am sure that I will use this often. Thanks for sharing. Greetings Sumit, I really like this as it addresses something I’ve been thinking about for some time. Creating a Histogram and using the standard deviation and color the chart accordingly. Your method would allow me to assign the target line as the Standard deviation line, those below the line are my outliers and those above are within the acceptable range. Unfortunately I work on a Mac so I will be finding a way around my limitations to make this work. Thank you for your inspirations! That’s really awesome but How can i do it in Excel 2010. 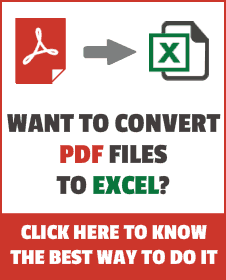 Great question, and I’m certain if you follow the instructions in the video, it should work well for you as it does for me, and I’m working on a Mac(Excel 2011) which has less capability than Excel 2010 for Windows. 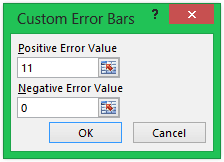 I think you are the best in excel dashboard. Hi Sumit. Any tips on how to create a excel dashboard. I would soon be writing more about dashboard examples and how to create it. Hello Sumit! I downloaded this template but target line is not moving by scrolling.Do I need to change some excel opetions? Hello Imran.. Thanks for pointing out. I have updated the download file. Thanks Pavi.. Glad you liked it.